PRTG (Paessler) Network monitor is a great piece of software for monitoring your network, but more so, it also has a Built-in Free Syslog Server. According to their website, PRTG has a sensor type for collecting Syslog messages that gets stored in their High performance database. All the major components of a syslog server are part of their offering, including alerts and alarms based on what the content of the syslog message has and the severity of the event. Further centralizing your alerting, monitoring and collection of events from multiple systems is a must when your environments starts to grow. In order to run this Syslog server, you'll need to have PRTG Network monitor installed and then add the syslog server sensor to any probe devices within the software – PRTG will then start collecting messages from your devices. 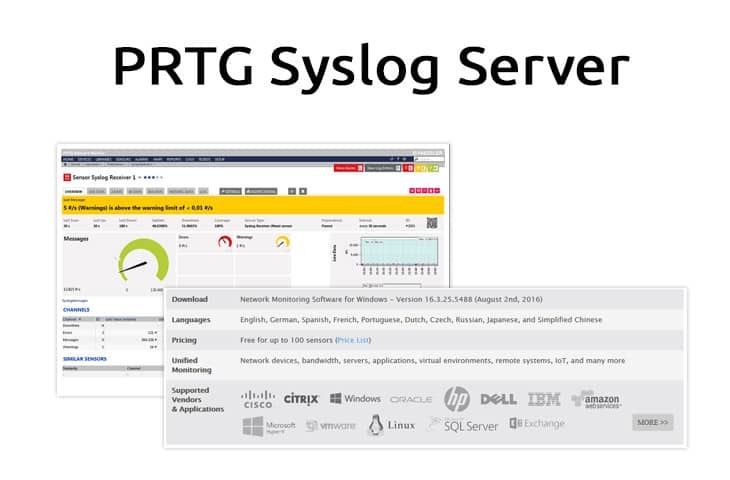 PRTG runs on all supported Windows Operating Systems and one of the downsides of this software is that it is not a stand-alone Syslog Server, like others we have reviewed. You'll need PRTG installed in order to use it, which isn't a bad thing if you already are using it in your Network Monitoring efforts. Although there is a Paid version of PRTG, you can use the Free Version of PRTG as well in this instance. 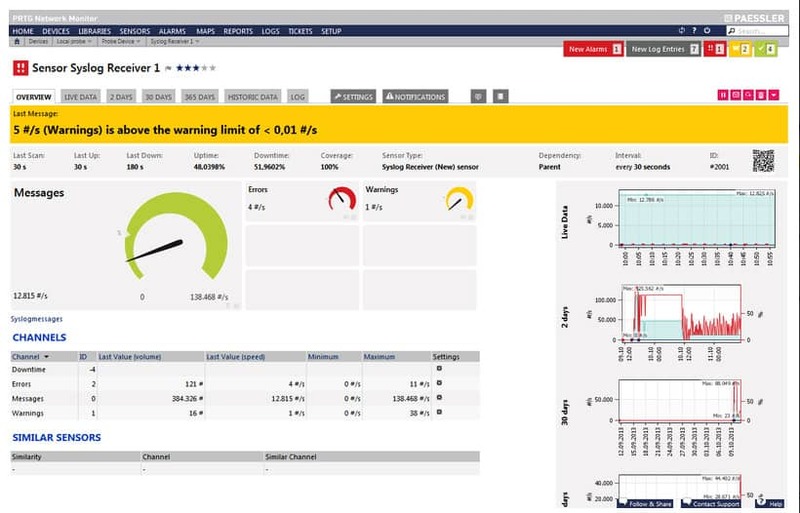 Bundled with the software suite comes a flexible alert system that gives you 9 different notification and alert methods, including Email alerts, SMS Text alerts and even running an external program for notifying network engineers and admins about possible issues within syslog messages and your infrastructure.